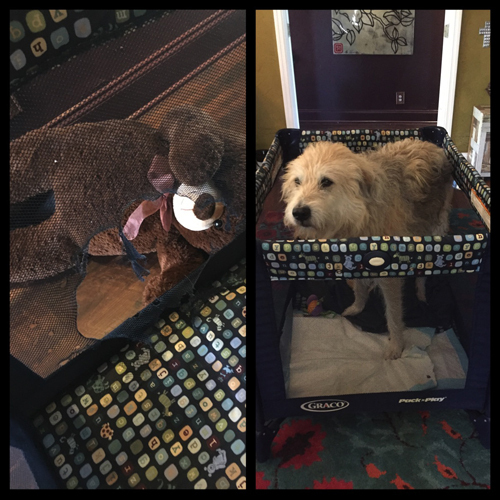 when we first brought juice home he only weighed a few pounds so the safest “housing” for him was a pack n’ play. at 5 months old he’s now big enough for a traditional crate but he loves his playpen (lovingly referred to as “the bin”) so much that we haven’t had the heart to take it away. the real issue is that it has been beat to death…both by dogs trying to break in (and by dogs i mean fletcher and only fletcher) for absolutely no reason and by juice trying to break out…and in. we’ve used an entire roll of duct tape patching it up but it’s getting frustrating because we’re battling both ends. if juice is out and wants in he’ll break in, we patch it and the next time he may decide he wants out when he’s in…basically juice does what juice wants to do. because the bin also needs to function as an actual holding vessel at night we have to keep patching it…and he seems to have to keep ruining it. we’ve tried brainstorming how we can make a “door” that essentially locks when we need it to but we haven’t really put our all into it since the roll of duct tape is right there. the one thing a pack of dogs will teach you is there’s always something…maybe if we stick with this something they’ll hold off on a new something.